M.T. Richardson Co. 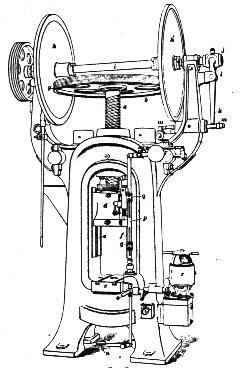 Scope of the Screw-Press Forging. -- The scope of the screw press forging is confined to shapes that do not require breakdown operations, or such as have been forged so as to fit the dies. The forging is completed in one stroke or squeeze of the screw. With friction drives there is little danger of jamming the press from an increase in thickness of the flash. These presses do not require any special foundation, as there is no jar or shock in their operation. They make strokes from 10 to 40 per minute and exert pressures from 25 to 1,800 tons. The screw press may be used for a great variety of hot or cold metal forgings. Besides open die forgings, metals may be extruded through dies, squirted up around the punch or formed in enclosed dies. According to Grant Sarver, the late model machines he sells are more flexible and are good for all general operations except drawing.